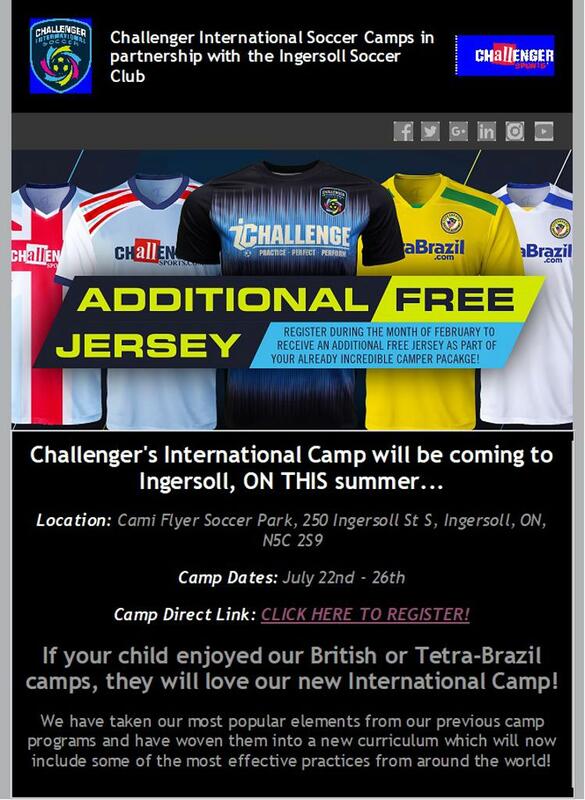 Ingersoll Soccer Club is pleased to announce partnership with Challenger Sports, the leading soccer camp company in North America. Challenger have recently combined the most popular elements of their two existing industry-leading camp programs, British Soccer and TetraBrazil, with a collection of some of the most effective soccer practices used by youth teams around the world. This summer - July 22nd - 26th at Cami Flyer Soccer Park, 250 Ingersoll St S, Ingersoll, ON, N5C 2S9 - We are excited to host this brand new, innovative and fully integrated soccer camp that will accelerate the learning process of our players! - These Camps reflect the truly global nature of the sport today and provides young players with a wide variety of coaching styles, practices, and influences that will help them develop a well-rounded skill set.